Above price for straw hat only. For headband pricing click here. Is your business in the outback and outdoor leisure industries? If so, our Cowboy Straw Hat makes for the perfect promotional hat for all your customers. This straw hat is made from natural breathable straw and features an internal sweatband. 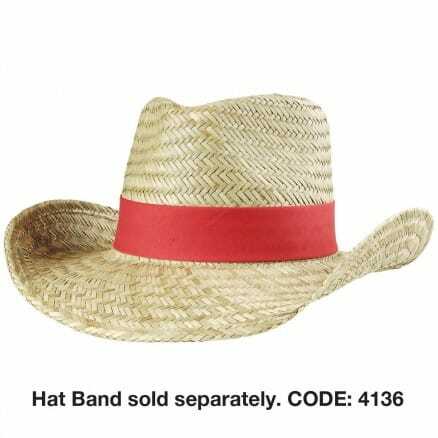 Our Cowboy Straw Hats are available un-banded, or you can purchase the hat band separately. We are also able to tack the band to the hat to ensure your brand is continually promoted. These hats provide a great marketing opportunity at music events and festivals, and for businesses within the outdoor leisure industry including travel, entertainment, fishing and more. Well-made and durable, the Cowboy Straw Hat is a great promotional merchandise item, and work well as giveaways. 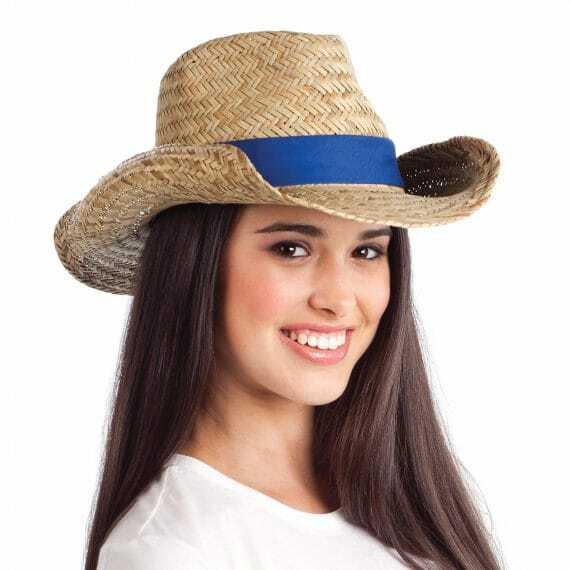 If your business is looking for a stylish and comfortable promotional straw hat, you can’t go past our Cowboy Straw Hat for your marketing and promotional needs. Hat bands sold separately. Tacking of hat band to hat (at additional cost) highly recommended – P.O.A.